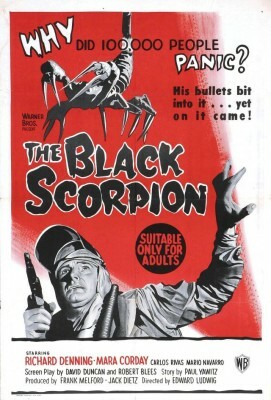 Highly derivative and unique at once, The Black Scorpion (1957) is a ‘50s "big bug" sci-fi thriller notable for its stop-motion animation, supervised by the legendary Willis O'Brien (of King Kong fame) but animated mainly by his assistant, Pete Peterson. The picture is almost emblematic of distributor Warner Bros.'s peculiar attitudes toward horror and sci-fi during the decade. They picked up for distribution but did not themselves produce The Beast from 20,000 Fathoms (1953), the seminal Ray Harryhausen stop-motion movie, which proved a huge box office success. Their own in-house follow-up, Them! (1954), was enormously profitable as well but, oddly, they didn't follow that success with other science fiction films. Where studios like Universal and Columbia regularly made genre films until, creatively, they ran ‘em into the ground, Warners made a potful of dough then inexplicably made no more, leaving it to others to imitate Them! 's components. Warner Bros. distributed Hammer's $270,000 The Curse of Frankenstein the same year as The Black Scorpion, and that picture was an even bigger hit, earning as much as $8 million, yet Warners let Columbia release the sequel and didn't distribute another Hammer film for ten years. The Black Scorpion was yet another outside production only distributed by the studio. Jack Dietz, one of the indie producers of The Beast from 20,000 Fathoms, was behind this one, too, though underfinancing and an absence of the type of careful planning inherent in Ray Harryhausen's concurrent stop-motion features is obvious and seriously damages The Black Scorpion's potential. Indeed, the movie seems less imitative of Warner's Them! than of Columbia's annual Harryhausen pictures. The biggest problems with The Black Scorpion are (1) that at 88 minutes it's fatally overlong and draggy; and, (2) the clumsy script pointlessly imitates elements of Them!, with added gaping plot holes and other flaws. Them! was structured as a mystery but in The Black Scorpion the audience already knows what's coming, and the glacier-paced script tests their patience. They know the monster is a giant black scorpion (in fact, the movie offers quite a large number of the big, nasty-looking creatures), yet there's way too much stalling until we get to the "good stuff." As it turns out, the "good stuff" is really good, lively stop-motion animation. Whether it's worth the long wait is another matter. Undoubtedly to save money, The Black Scorpion was filmed in Mexico. The story follows geologists Dr. Hank Scott (Richard Denning) and Dr. Arturo Ramos (Carlos Rivas) as they investigate the birth of a new volcano following a huge earthquake. Venturing into devastated rural areas, they are puzzled by unusual damage and inexplicable deaths. In one small village they stumble upon a completely mangled police car, the dead body of a policeman (his face frozen in fear) and a seemingly abandoned infant, but no other villagers, living or dead. After a lot of driving around in their jeep, helping thrown horseback rider and rancher Teresa Alvarez (Mara Corday) along the way, eventually they realize that the earthquake and volcano have unleashed eons-entombed prehistoric monsters. They find vast caverns where large nests of scorpions dwell. Hank and Arturo bravely explore the caverns where they also encounter giant spiders and worms (inchworms, technically, but the term hardly seems apropos). As in The Beast of Hollow Mountain (1956) and Valley of Gwangi (1969), a precocious Mexican boy continually gums up the narrative. Here he's called Juanito, played by the same child actor, Mario Navarro, who had essayed the same part more or less in Hollow Mountain (and who'd play a variation of this same character in The Magnificent Seven). Eager to prove to Hank that he's all grown up, he rushes headlong into danger early in the story, necessitating his rescue from the scorpions. When Hank and Arturo are about to be lowered into the seemingly bottomless cave, Hank instructs Teresa to look after the boy, but he sneaks aboard with Hank and Arturo and has to be rescued again, this time from a colossal spider. Only when the trio is barely pulled to safety does Teresa even realize that the kid had snuck off. Some babysitter. Denning, Corday, and for that matter, Rivas, are all appealing actors, Denning and Corday already sci-fi veterans (she for Tarantula and The Giant Claw, he for Creature from the Black Lagoon, Target Earth, Day the World Ended, and Creature with the Atom Brain), but the screenplay is bereft of any imagination or innovation. It's merely going through the motions. Denning's and Corday's relaxed charm keeps them interesting, not the script. The monsters are something else. O'Brien didn't have enough time or money to make his stop-motion characters as good as they might have been, but several of his sequences in the film are outstanding, much superior to the rest of the film. Several bus-sized scorpions hiding under a bridge, chase a truck, pluck a lineman off a telephone pole, and later knock a train off its rails, stinging and eating victims, pincers from several scorpions all grabbing at the hapless humans at once - riveting stuff. Much of it was shot as test footage for a proposed film that eventually evolved into The Black Scorpion, with the screenplay built around this test footage. In another highlight, Hank and Arturo are lowered into the deep cavern filled with various scorpions, as well as monsters played by armatures left over from the infamous deleted "spider pit" sequence in King Kong. Throughout these two scenes, the scorpions are unsettling to watch precisely because they scuttle about like real-world arachnids, only much, much larger. But the movie ran out of money, greatly diminishing the effectiveness of the climax, where the biggest of the scorpions threatens Mexico City. Several shots feature not the three-dimensional model but simply empty travelling mattes (similar to some shots in Tarantula), "which results in what undoubtedly is the blackest scorpion of all time," as genre historian Bill Warren noted. Several effects shots also are used more than once, adding to the cheap look. Warners added a big, perpetually drooling prop head of a scorpion to insert into these sequences. The head only vaguely matches the features of the stop-motion models and looks more than a bit silly. Almost perversely, it's this outrageous prop featured prominently in most of the film's advertising. Warner's Blu-ray of The Black Scorpion is a major upgrade from earlier DVD releases, though still problematic. Likely inherent in the original release, many shots are simply blurry and out-of-focus, particularly composite shots joining wide angle live action with paintings or models of the volcano. It's quite strange: some shots are almost amateurishly out-of-focus while others are razor-sharp. Because the script has the scorpions most active at night, day-for-night filters and postproduction optical printing causes other visual anomalies: extreme graininess here, soft, dark, and blurry there. For the eyeballs The Black Scorpion is wildly inconsistent. The film is presented in 1.78:1 widescreen, approximating its original theatrical aspect ratio. The DTS-HD Master Audio (2.0 mono) is adequate, and optional English subtitles (but not French or Spanish, like the DVD) are included. The Blu-ray repurposes all of the extras from the original DVD: "Stop Motion Masters," a featurette with stop-motion master Ray Harryhausen; test footage of the "Las Vegas Monster" and "Beetlemen"; stop-motion clips from Irwin Allen's The Animal World (1956), featuring effects by O'Brien and Harryhausen; and a trailer. However, all of this material uses standard-def masters and has not been remastered. More for stop-motion fans than even casual ‘50s sci-fi buffs, as a movie The Black Scorpion is mediocre, but the stop-motion effects justify sitting through it once. Recommended.